I am featuring pumpkin in some of my breads this month at the bakery. Instead of making straight pumpkin bread, I decided to go with breads with pumpkin in them. This is a modified version of the rustic bread I made a while back, and it is delicious. 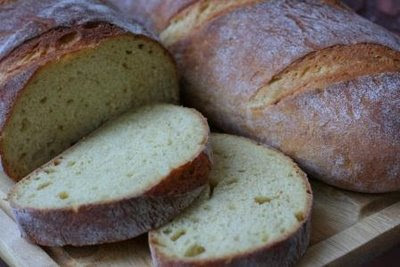 The pumpkin gives the bread a soft texture and a light yellow-orange colour. 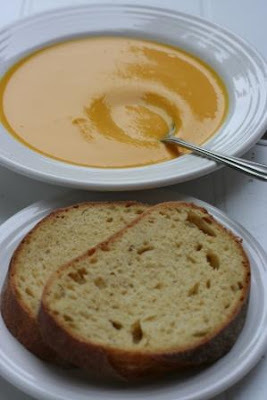 This is the perfect bread to serve with a hearty vegetable soup, or with the pumpkin soup pictured below. 1. Make the preferment: Put the yeast in the water and stir. Mix the flour and salt together in a bowl and pour in the yeasted water. Mix until the flour is hydrated, adding a little more water if necessary. Cover the bowl with plastic wrap and leave the pre-ferment out at room temperature overnight (up to 16 hours). 2. Make the dough: To make the final dough, combine all of the ingredients except the pre-ferment in a mixing bowl. Chop the pre-ferment up into small pieces and mix in. Turn onto a floured surface and knead for 10 mins, until smooth and thoroughly combined. Dough should be tacky but not sticky, so knead in flour accordingly. 4. At the end of the fermentation, divide the dough into two pieces and preshape each into a ball. Cover with the towel and let each rest for 5 to 10 minutes before shaping into a loaf with tapered ends. Once shaped, place on a floured linen towel and cover the loaves with the damp towel. Let rise for 1 hour, gently rolling the loaves over after 30 mins. 5. Halfway though the final rise, begin preheating the oven and baking stone to 450 degrees. Place a cast iron pot on the bottom rack and fill with boiling water 10 mins before you start baking the bread. 6. Transfer to a floured peel, and slash the tops of the loaves with a razor blade. Bake for 25-30 mins, rotating the loaves 180 degrees after 12 mins so that they'll bake evenly. Crust should be a deep golden brown, and loaves should sound hollow when you knock on the bottom.